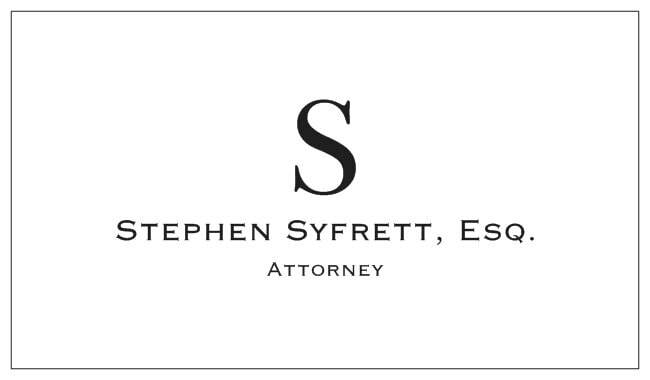 My Practice Areas - Stephen Syfrett, Esq. Many local businesses find themselves dealing with situations that they never anticipate when they first start out. Many times, with the right guidance and experience, businesses can make decisions on the front-end which save them from disputes later. Our firm provides a full array of services from general counsel to litigation. We can help you with contract disputes, business liability, corporate litigation, consulting services, modification of a business and many other services. While these are our normal areas of business, we work hard to help our clients reach their goals. All of us work for a reason; to build something for our families and our futures. We can help you with wills, trusts, estates and other ways to plan for your future. We also can help you with the creation, maintenance, and proper structuring of Limited Liability Companies, Corporations, and other Florida business entities. Whether someone has injured you or your family, interfered with your property or your business, or done something else to violate your rights, our firm can help. People make decisions all the time without regard to the impact that it will have on others. When they do this, the law provides you with a way to make them internalize the harm they cause. Our firm's typical areas of practice include personal injury, property damage, breach of contract suits and defending civil suits for our clients. When either a business or marriage is formed, few of us think about what would happen if things don't work out. In Florida, Divorce actions can range from simple matters which can amicably be resolved, to long, intensive fights that feel like they have no end. Our firm tries to bring value to our clients in whatever type of case we undertake for them, and Family Law is no different. 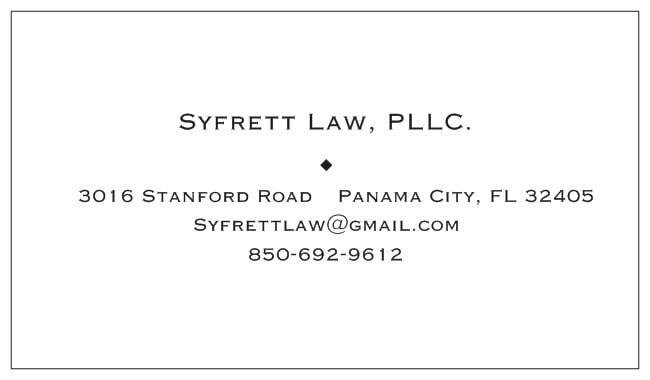 Mr. Syfrett always strives to work with his clients and opposing counsel to make divorces as smooth and easy as possible, given the difficult nature of these cases. Liberty is the essence of what makes us Americans. It is our most cherished value, and I have always felt righteous indignation when the Government seeks to curtail someone's liberty. A criminal investigation and prosecution is the ultimate curtailment of liberty. Nobody wants to be in this position. Ever. For most people, any interaction with the State or Local Government is an inconvenience at best, but criminal prosecution by the government is one of the most stressful things a person can endure. Criminal Defense is not my typical day - to - day work, but I love to help people who don't deserve to be in the criminal justice system retain or reacquire their liberty. I can assist with early termination of probation, expungement, and ordinary criminal matters. While I do have experience with cases as serious as murder, I typically can help you find someone in our area that will best serve you with serious criminal matters, after the case is in a stable condition, and your rights have been protected. Our firm provides a somewhat unique legal service that helps the whistleblower, the government, and the tax payers. Working with government agencies, a citizen with information which leads to the prosecution or civil recovery of a fraud against the government is entitled to a percentage of the fraud recovered. Our firm works to investigate these frauds, and in turn file complaints for our clients with government agencies. After the investigation and complaint are complete, the government agencies in turn investigate and prosecute the fraudster. Once they have successfully recovered assets and fines from these fraudsters, the whistleblower gets a percentage of the entire recovery. There are many different types of frauds that could fall under this area of practice, but typical areas include Medicaid and Medicare schemes, illegal kickbacks and commissions, tax evasion and IRS frauds. ​Working with our firm, our clients help the government detect and end frauds which waste taxpayer money, and are compensated for helping bring about the recovery. Because without the whistleblowers, many frauds go undetected for years.